Seagate has announced the arrival of the FreeAgent GoFlex, the first portable external hard drive on the market which comes packing 1.5TB of storage. The drive is a mere 2.5 inches and has enough capacity to store 60 HD movies, 750 video games, countless photos or one Godspeed You! Black Emperor track. To ensure that you can transfer files over in the fastest way possible, the Seagate FreeAgent GoFlex comes with USB 3.0 connectivity and will play fair with both Windows-based PCs and Macs. It also allows you to use the hard drive on both a Mac and PC without the need to reformat the drive. While this type of interracial computer shenanigans may shock some of you, it's great that the GoFlex is equipped with a NTFS driver to do this. 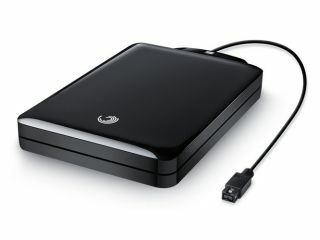 "Bringing this solution to market on the heels of our 3TB GoFlex Desk drive and the Momentus XT solid state hybrid drive is proof of Seagate's continuing technology leadership and tradition of setting storage industry milestones," explained Darcy Clarkson, vice president of Global Retail Sales and Marketing for Seagate, who has the uncanny ability to namedrop other products in quotes. The FreeAgent GoFlex 1.5TB external hard drive is available now (and also comes in the less capacious sizes of 320GB, 500GB, 750GB, and 1GB) and will cost $249.99 (UK price is to be announced).